nursing | Eat. Read. Ask. Do. Be. Finally, after 30 months, three states, nearly 50 labors (attended, not personally experienced) I have graduated from Vanderbilt and moved to Seattle to be reunited with Sugar. I am also glad to be back together with Jared, who has been extremely supportive of me in a way that makes me smile from the inside-out. I can’t express the overwhelming sense of accomplishment and relief that comes from having successfully completed this stretch of long-distance relationship-ing. I am hopeful we won’t have to do this again, but I know better than to make declarative statements on that front. I also have some exciting news that has to do with pregnancy — those belonging to my future clients at my new job (see what I did there). I have accepted a position as a certified nurse midwife with Empowered Pregnancy, a new birth center opening this summer in Kirkland, WA. We will be offering full scope midwifery and women’s health services to those living in the greater Seattle area. I will now wait while you take a moment to like our Facebook page. If you chose to ignore my instructions, I am a little salty with you, but will support your choices. Speaking of supporting choices, I am also working as a clinician with Planned Parenthood which, combined with opening a new birth center, is pretty much my dream scenario. I’ve spent the last six weeks sitting around, reading, wandering and re-watching The West Wing, which may sound like a queen’s existence, but I’m ready to get back into the world of three dimensions and put this pricey education to work. Hopefully I will be able to use my new-found lack of time to be a more active blogger, which would bring me great joy. Or maybe this is just an Monday morning energy boost, who can tell? The back to school or work adjustment is always a challenge post-holidays. On the one hand, people are often invigorated with big plans for new year, which is adorable. On the other hand it’s cold and, in my case, lonely and trying to get back into a routine after time off can be a little bumpy. Everything you had delegated to future you is now present you’s problem and I always have more faith in future Lea than she really deserves. But in any event, here we are. Mostly due to excessive aforementioned faith in my future self, my past self decided that my partner and I should visit three states in the 10 days he could reasonably be expected to take off work for the holidays. Fun! So, we did it: Texas for Christmas, Florida for Hanukkah and New York for New Years. It was as crazy as it sounds but totally necessary and worth it. We had recently seen the family we have in Arkansas and California, but the Floridians and New Yorkers had yet to see the whites of our eyes since we became a married couple. Our jaunt included planes, trains and automobiles, Texas BBQ, Florida beaches and Times Square on New Years (just kidding, only a crazy person would do that). Our hearts and stomachs were filled with love, pizza and bagels and before we knew it was back to reality, whoops there goes gravity. School has been back for a week now and this year marks the start of my clinical rotations as a midwifery student. It reminds me a lot of my first rotation as a nursing student with all the fumbles, missteps and fear. I had the great pleasure of enjoying dinner with some of the colleagues I shared my very first nursing rotation with and the laughs we had while reminiscing reminded me of the post-rotation conferences we had when we were all still learning to listen to hearts and lungs. I always consider the beautiful souls I went through undergrad with to be kindred spirits from whom I can never really part. The impact of nursing school has bonded me to some of these people in a similar way. The image of being surrounded by my male colleagues outside the room of a patient whom I was about to catheterize is forever burned in my memory. “Is he circumcised?” they asked. “I’m not sure,” I replied. My preceptor then asked if I had ever seen a foreskin, to which I quickly replied, “I really don’t see how that’s any of your business.” We were off to a great start. Ultimately the procedure was successful, but there was and is always one thing to do in nursing school before you are allowed to call it a day: reflect. Any day that comes anywhere close to feeling as connected as I did to those people during that rotation will be an opal in a week of dumb, stupid rocks. Here’s to hoping we all continue expanding ourselves with people we can have a really good belly laugh with; I’m convinced those are all that really matter in this world. The placenta is a confounding element of labor and delivery. Giving birth to a brand new entire person is largely hailed as the single most challenging and unifying event humans undertake (along with death, but more on that later). This monumental feat comes after growing this would-be human INSIDE of you, which – let’s be honest – is pretty bananas. So after 40ish weeks of gestation and who-really-knows how many hours of labor, you have a baby! But, it’s not over yet. Now comes what we refer to as the 3rd stage of labor, a part so important it had its own category: delivery of the placenta. This new organ is something you grew before the belly fruit began to resemble anything other than a seahorse (yes, offense). The placenta makes good use of all the extra blood you’ve been pumping around (up to 50% more in fact) as it transmits nutrients and oxygen to the fetus and acts as filter for bacteria and other unsavory characters you’d prefer your child waited until daycare to meet. Its delivery has to be carefully attended to because any retained pieces can cause serious problems for you and ain’t nobody got time for that – you’ve got a baby now! So once this blood filled, brain looking, much-bigger-than-you-thought-it-would-be thing is delivered and examined, what do you do with it? 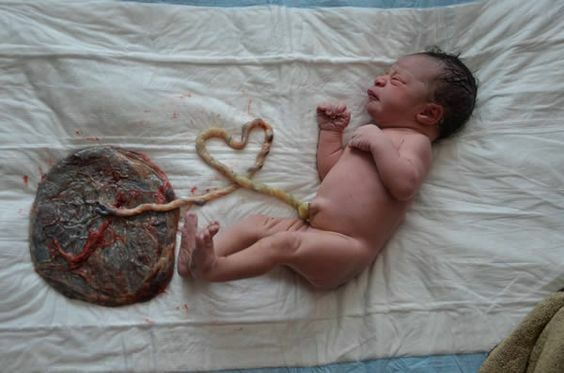 The placenta is a mystifying entity that different cultures hold in various high regard. Some groups believe it has a spirit of its own and must be buried near the family house as a guide of sorts. This doesn’t seem so strange to me – it has to be gestated and born along with the baby, and without it, baby would have never made it this far. Other cultures use it more practically as fertilizer – all hail the pragmatist. Companies have been built around their ability to encapsulate it so that you can eat it; preesh you, capitalism. And, of course my favorite, carrying it around with the baby until the umbilical cord (along with the placenta) dries up and detaches on its own: the lotus birth. A majority of westerners do nothing with it and it is incinerated (BOR-ING). As with most things in birth, to all of these options I say yes. Women need to support other women as we navigate the veritable cornucopia of options available to us. And now, a picture. Because in 2017, infographics and nihilism will be the only truth. Lotus birth, even though we both know you already Googled it.